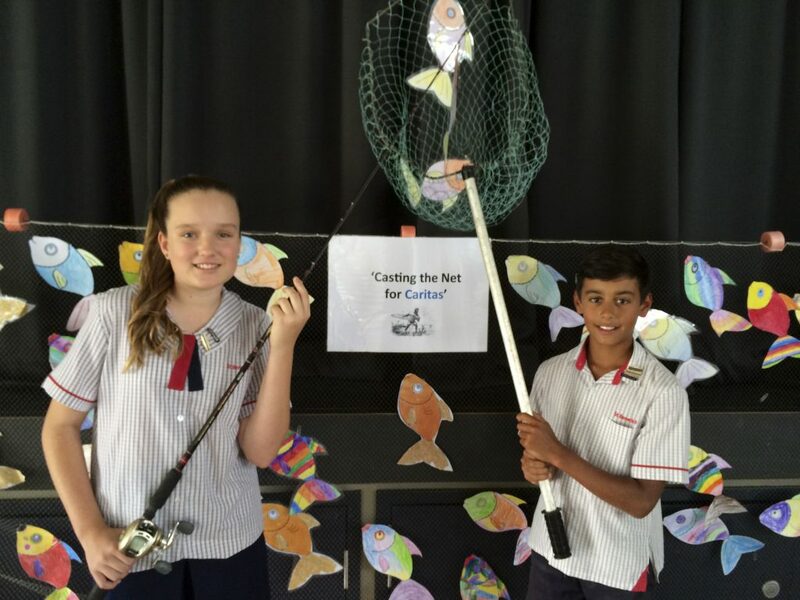 Casting the net: St Benedict’s Catholic Primary School captains Emily Miller and Tyler Duncan lead the way in the school’s ‘Casting the net for Caritas’ Project Compassion fundraising campaign. ST Benedict’s Catholic Primary School assistant principal for religious education Brett Kitchener was pleased with the school’s effort in raising more than $5000 for Caritas Australia’s Project Compassion this year, but he was even more impressed with the way it was done. “I was so proud of the initiative, leadership and learning I witnessed on so many occasions throughout the (annual fundraising campaign),” Mr Kitchener said. “From my perspective the 2014 Project Compassion campaign has been at least as good if not better than any other we have committed to in our short history. (St Benedict’s was established at Mango Hill in 2008). “The children all embraced the concept enthusiastically. “In addition to each class, groups such as our student council, Outside School Hours Care and specific year levels demonstrated both initiative and leadership in their quest to make and sell items such as cupcakes and friendship bracelets in order to raise our total. The school finalised the Project Compassion campaign with an announcement at a recent assembly. Mr Kitchener said the school chose “the achievable target – $30 providing a South Sudanese family with fishing equipment and we chose a fish template to represent each multiple of $30 collected”. “We called our campaign ‘Casting the net for Caritas’. We’ve found with all themes we’ve committed to in recent years that making the theme achievable, visual and (easy) for the children to relate to leads to success both in understanding and in the financial success of the program,” he said. The school raised more than $5000 and over 160 multiples of $30. Caritas Australia’s Brisbane diocesan director Joe Foley recently participated in the Laps for Life walkathon, a Project Compassion fundraiser at St Pius Primary School, Banyo. Mr Foley said that every year members of the St Pius school community “go out of their way to improve the lives of those less fortunate”. “St Pius Primary School, Banyo, only has 300 students, yet they raise a staggering amount of money through their Laps for Life walkathon, in support of Project Compassion,” he said. “For the second year I have been very fortunate to walk with the students, most students covering around 4km, some as much as 7km. Mr Foley thanked all staff, students and parents “for helping to end poverty, promote justice and uphold dignity”. Next: Do I have the right or the nerve?